Jesus’ “Sermon on the Mount” was all about the “Kingdom of God” and what it takes to be a committed citizen of that kingdom – in other words a disciple. Nowadays we have the peculiar modern anomaly of dual citizenship. For most of history, however, people instinctively understood citizenship as one’s highest earthly loyalty, something which by definition precludes dual allegiance. Likewise, when it comes to citizenship in the kingdom of God, Jesus is equally exclusivist: “No one can serve two masters. He will either hate one and love the other, or he will be devoted to one and despise the other” [Matthew 6:24]. No surprise there! Nor should we be surprised when Jesus singles out material wealth as the great alternative that can most effectively undermine our commitment to God. “You cannot serve God and mammon,” Jesus asserted, without qualification or nuance. Now obviously Jesus understood that we all need material things – just to live, let alone to live well. Jesus lived in a world of scarce resources. In pre-capitalist societies, most people are poor and have to focus most of their energies on just making a living. Jesus himself depended on the generosity of others. Luke’s Gospel specifically mentions a number of wealthy women who provided for him and his disciples out of their resources [Luke 8:3]. And any number of Jesus’ parables praise hard-working people, whose industriousness Jesus proposes as a model for his disciples to adopt in their religious life as well. Jesus’ words of warning were not addressed abstractly or theoretically. They were addressed to individuals directly and personally. We all know what worrying can do to a person, how it can completely capture and immobilize a person. In extreme form, worry becomes obsessive, a compulsive disorder that practically paralyzes a person, totally distorting one’s perspective, the proper perspective that comes from being able to set proper priorities in one’s life and keep one’s priorities in order. (A peculiarly religious variation of this is what we call scrupulosity, an obsessive worry that everything one does is a sin, a total distortion of what our relationship with God is supposed to be about, leaving one feeling as forsaken as Zion in today’s first reading [Isaiah 49:14]). Jesus challenges us to focus on what is important – to keep our concerns about material things in some sort of perspective. We do this all the time – or at least try to, if we are reasonably sane and focused – in our ordinary, day-to-day decisions – distinguishing what we can and cannot control, what’s of real importance from what is a sideshow, what’s of long-term value from what is short-term. Jesus wants us to do the same with what is most important – to seek first the kingdom of God and his righteousness. Comparisons between the anti-government protests in Wisconsin (now seemingly spreading to other states as well) and the anti-government protests spreading around the Arab world are undoubtedly overblown – whether one sees them both as popular expressions of authentic democratic values or whether one judges Midwestern attempts to frustrate the program of the democratically elected government as ultimately somewhat anti-democratic. Either way, the situations are sufficiently different to argue against trying to draw too many parallels or any too easy comparisons. That said, however, what is happening in Wisconsin and elsewhere may be almost as important for the future direction of American society as some of what has been happening in the Arab world is there. The Wisconsin situation seems to invite ideological extremism. Either one is for public-employees’ unions - or not. Either one is for getting the deficit under control - or not. And, of course, the ideological divide is mirrored in the positions of the two political parties – the Democrats in general siding with the unions, the Republicans in general against them. In actual fact, of course, as in most real-world situations, both ideologies – and both parties - have valid points to make. I grew up in the post-war “Baby Boom” years when the propserous American economy exceeded anything most people had ever previously experienced. Labor unions had contributed notably to this incredible elevation in the living standards of the “working class.” In fairness to organized labor, it is only right to recall that what we now look back on almost as a “golden age” for ordinary American workers was also the period when unions were most powerful. (That prosperity, incidentally, also coincided with significantly higher tax rates than today, but that is another discussion). Of course, the labor market has changed radically since then, radically altering the situaiton of organized labor. All the attention being focused on public employees’ unions highlights the fact that labor union membership in the United States has been declining in recent decades and that the one area in which unions seem to have (until now) maintained a powerful position has been among government employees. No doubt there are multiple factors contributing to this, but one seems especially obvious. The decline of unions has corresponded to the movement of jobs away from the traditional bases of union power, in the first place, to other jurisdictions in the United States (e.g., “right to work” states) and more recently to other countries. “Globalization,” “free trade,” etc., have all been characterized by the movement of jobs away from the high-cost labor market in the US (and from the union-friendly states within the U.S.) Government employees are in contrast one group of workers whose jobs, for the most part, cannot move to cheaper foreign labor markets at home or abroad. So the rise of government employees’ unions is in reality a commentary on the changed character of the global labor market – and the consequent decline of organized labor’s power. At the same time, it highlights how different is the position of government employees’ unions vis-à-vis private sector unions. In private industry, unions have an incentive to see companies make a profit. High Wages, benefits, and “job security” don’t count for much in the end if they help put a company out of business. But governments generally don’t go out of business. Unions have less incentive to moderate their demands, while the politicians on the other side of the bargaining table likewise have less incentive to alienate workers (who vote, after all, and whose unions endorse candidates and contribute to campaigns). The latter point highlights yet another – specifically political – factor. Unions in general (and the teachers’ unions in particular) are notoriously pro-Democrat. Given the obscene amount of money that nowadays goes into political campaigns, unions represent one solidly Democratic constituency that can be relied upon for help at election time. Just as many Democrats (at least in theory) would like to eliminate or reduce the influence of corporate money in politics, many Republicans would just as logically like to do the same with organized labor. This particularly political dimension of the controversy seems especially evident in Wisconsin where it seems to be primarily the more reliably pro-Democratic unions that appear to have been targeted. Some elements on the right have long disparaged public employees as somehow less deserving than private sector workers. While this may be largely unfair, it has worked. And then there is the special case of teachers’ unions, which are even more particularly unpopular because of the widespread perception (probably justified to a considerable extent) that teachers’ unions represent a major obstacle in the way of meaningful educational reform. So there is plenty of right and wrong on both sides of the current shouting match. As for the deficit, again there is plenty of blame to go around – in both political parties. In the 1942 film classic Holiday Inn, Bing Crosby buys a farmhouse, intending to retire, but soon turns it into an Inn (complete with lavish entertainment) that’s open only on holidays. That was when holidays were still something special. When I was growing up, the term “spring break” was foreign to us. (If we heard it at all, it was in the annual news coverage of misbehaving college students in Florida – nothing that had anything to do directly with us). Of course, we had our “Easter Vacation,” a substatial "break" beginning at mid-day on the Wednesday of Holy Week and continuing through all of Easter Week. But in addition to our “Easter Vacation,” we also had a whole bunch of holidays. The “spring term,” which began officially on or near February 1 (thus inadvertently replicating ancient Celtic seasonal consciousness), included several such holidays. February gave us Lincoln’s (February 12) and Washington’s (February 22) Birthdays. March 17 was St. Patrick’s Day – not a legal holiday, of course, but a holiday for Catholic school children in New York, whose “rightly constituted principal patron” St. Patrick is. May brought another religious holiday - Ascension Thursday - and a big legal holiday, Memorial Day, which we typically observed (as the holiday was originally intended to be observed) by visiting the cemetery. Whatever still lingered of the properly civic meaning of those legal holidays was eviscerated in 1971, when the Uniform Monday Holiday Act of 1968 went into effect. This law moved four federal legal holidays (Washington’s Birthday, Memorial Day, Columbus Day, and Veterans Day) from their proper dates to designated Mondays – in order to create four fixed 3-day weekends for federal employees (and by extension others as well). Veterans Day was soon moved back to its traditional date (November 11), but none of the other holidays has had a comparable constituency sufficiently concerned about its essential civic meaning to get its traditional date restored. In a sense, none of this matters much anymore. Along with the loss of the civic significance of days like Washington’s Birthday, has come the loss of any real sense of “holiday” at all. More and more people have to work on the holiday. Schools and even banks are now open in some jurisdictions. Even the parish office is open today! Of course, it also used to be the case that there was a weekly holiday called Sunday, to which these occasional extra holidays were wonderful additions. When Constantine the Great declared Sunday a legal holiday in the Roman Empire in A.D. 321, he did a true service to humanity (not quite, but almost, as significant as his legalization of Christianity). It is obviously no accident that with the decline of public Christianity in the West has come the decline of Sunday as a real holiday when people don’t do ordinary activities and instead worship God and enjoy life. Sunday may still appear printed in red on our calendars, a vestigial relic of our once Christian culture. Likewise, Washington’s Birthday may also still appear in red, a relic of our once vibrant civic culture. With Sunday the ur-holiday now diminished almost beyond recognition, is it any wonder Washington’s Birthday now seems so insignificant – both diminished along with the world which produced them? “Be perfect, just as your heavenly Father is perfect” [Matthew 5:48]. Sounds pretty demanding, doesn’t it? Not just “be good,” but “be perfect” – just as our heavenly Father is perfect. And demanding it is. No question about it! Extreme as it may sound, however, there was in fact nothing new really in Jesus’ demand. We just heard the Lord tell Moses: “Speak to the whole Israelite community and tell them: Be holy, for I, the Lord, your God, am holy” [Leviticus 19:1-2]. God is holy. So his people should also be holy. Holiness describes who God actually is and must likewise describe who we are if we are actually God’s people – and must also then have recognizable consequences for the kind of person I am and the kind of person I am becoming as a member of God’s community. St. Paul picks up on the same theme: Do you not know that you are the temple of God, and that the Spirit of God dwells in you … the temple of God, which you are, is holy [1 Corinthians 3:16-17]. That the scorching desert sun afflicts the good as well as the bad and that the life-giving rain, which makes the land livable, benefits the unjust as well as on the just was something perfectly obvious to Jesus’ contemporaries – as it should be to us. Becoming the person God is calling one to be involves much more than just getting over our anger and letting go of our resentments. It means making God’s holiness my own, letting God’s holiness take over my life, letting God’s perfection make up for my imperfection. Homily for the 7th Sunday in Ordinary Time, Immaculate Conception Church, Knoxville, TN, February 20, 2011. Like the really dumb debate about his birthplace, the President's religion remains an issue that just won't seem to go away. According to the Pew Research Center, 18% of Americans think President Obama is a Muslim, only 34% claim to know that he is a Christian, and 43% say they don't know his religion. The President's birthplace, of course, is a confirmable fact. That my not matter much to those to whom facts don't matter. There are always extremists at both ends of the spectrum, for whom ideology inevitably trumps facts - whether it's who killed JFK or whether the world's climate is really changing or whatever. When I was a grad student, I remember reading and quoting (probably approvingly in some particularly benighted moment) the claim that there is something "conservative" about the very notion of a "fact." There are conservatives and there are conservatives, of course, but one of the more charming characteristics of traditional conservatives (not the radical and destabilizing movements that pass for "conservative" in contemporary politics) is a certain respect for facts - for the inherent givens of human nature, history, etc. But I digress - back to President Obama's religion! That the President did join a church at a certain point in his life is - like being born in Hawaii - an historical fact. What that may actually mean in terms of his belief system today is, of course, another matter, more open to legitimate interpretation. Therein may lie the problem, inasmuch as the President does not so frequently display the predictable external markers of Christian identification that Americans have been accustomed to. expect in their presidents. That may be unfortunate for a whole host of reasons, but still it is quite a leap - a most unjustified leap - to jump from that observation to refusing to accept the President's repeated assertion that he is a believing Christian. And now along comes Bill Maher - a self-appointed anti-religious zealot - who has declared that he too does not believe President Obama is telling the truth about his religion. As Brent Decker of The Washington Times put it, "With friends like Mr. Maher, Mr. Obama doen't need enemies." I don't know how much of a "friend" of Obama, Bill Maher actually is. I'm guessing he likes Obama. Perhaps he's the sort of ideologue who expects that other smart people really agree with him, because what else would really smart people believe? I really just don't know. (But I guess Maher would really like it for the President to be in reality a skeptical, secular humanist - like himself). Apparently, the issue came up in the context of Maher's also not believing that the President is politically a centrist. Being a "centrist" is certainly an even more malleable identity than being a Christian. So there is certainly room for legitimate debate about what that means and whether it is a reasonable description of the President's policies. Extremists at the other end from Maher routinely imply that the President is some sort of "socialist" seeking to impose a "socialist" (or at least a "European") style agenda on America. Intentionally or not, Maher oddly seems to be adding more plausibility to that interpretation. In the end, it was left to my one-time Princeton classmate Cornel West to defend the President's Christian self-identification, which he did very effectively. Analyzing the decline and/or success of American religion in general - and of American Catholicism in particular - has become a staple of contemporary religious journalism. When I read the Pew Forum's 2008 "Religious Landscape Survey" last fall, I even devoted my pastor's column in the parish bulletin one week to its implications. So it was with interest that I read what veteran Vatican analyst John Allen had to say about it in his blog last week. What Allen calls "the banner headline" is that there are now some 22 million ex-Catholics in the U.S. In itself that is hardly news. It has long been observed that, in terms of numbers at least, ex-Catholics could easily be counted as a major denomination in its own right; and that, were it not for immigration, the shrinkage of the Catholic Church in the U.S. would be much more dramatically evident. Numbers, of course, are just that - numbers. It is their interpretation that is interesting - and relevant to any future plan of action. Not surprisingly, given the internal ideological polarization of American Catholicism, interpretations vary - typically in accord with the interpreter's ideological predispositions. So it was interesting to read Allen's blog, based on his conversations with the Pew researchers themselves. Personally, I found their interpretation somewhat mixed. On the one hand, they stress the fact that losing members is part and parcel of the American religious landscape, and that the Catholic Church (while losing many members) does not seem to be doing so disproportionately in comparison with other religious groups. So the key element in their analysis is the Church's apparently poor performance in recruiting new members - its ratio of recruitment to retention - all, of course, still somewhat obscured by the effect of immigration, which has kept Catholics at about one-quarter of the U.S. population despite its losses in members and failure to recruit replacements. On the other hand, however (and this to me seems the more problematic part of the analysis), the analysts suggest that the Church is serving is current members well enough, thus confirming that the pastoral problem facing the church is its failure at evangelization. The analysts ascribe much of the movement out of the Church to life-cycle changes. Some 2/3 of ex-Catholics leave by age 23. Some become Evangelicals (1 in 10 American Evangelicals is a former Catholic). Others enter mainline Protestant denominations. Many others affiliate with no church. The analysts attempt to be even-handed in regard to "conservative" vs. "liberal" explanations and place a lot of emphasis on non-ideological "drift." (71% of those who are "unaffiliated" apparently fall into that last category). Even so, the data seem to support a moderately "conservative" analysis. Prescinding from such unsurprising factors such as marriage to a non-Catholic, it has to be striking that so many Evangelicals are ex-Catholics. Whatever their motives, it's hardly likely that they became Evangelicals out of anger at the Church for its not having fulfilled some "liberal" agenda. Perhaps more to the point, the fact that so much of the Church's losses occur at the cusp of adolescence and young adulthood at least reinforces the "conservative" critique of American Catholic religious education. Other factors are certainly in play to be sure, but the pattern - especially the "drift" hypothesis - seems to confirm the failure of religious education (something probably self-evident to most Catholics outside the religious education establishment). Of course, it could be that it was always thus. I know plenty of people of my generation who, like me, went to Catholic schools and received a solid foundation in the faith, but then drifted away after the 1960s. Certainly, catechism by itself is never enough in the absence of institutional and cultural support for the faith - precisely what self-destructed at the same time religious education self-destructed. Finally, for all the attention lavished on RCIA these last 30+ years, the analysts certainly seem correct in highlighting the systemic weakness of Catholic recruitment. That said, however, the pattern of systemic loss - especially that due to "drift" - needs to be recognized for the profound pastoral problem that it is. In the 19th century, Servant of God Isaac Hecker sought to highlight the essentially evangelizing mission of the Church. He was always acutely aware, however, that for the Church to attract outsiders to it, its inner house must be in order. Just as grace builds on nature, a Catholic community with a vibrant evangelizing mission must, first of all, be a vibrant Catholic community, its vibrancy rooted in the best possible quality of pastoral care and formation for all its members. One three occasions in the past decade, I have had the opportunity to visit the shrine of Lourdes in France and have even been privileged to celebrate Mass in the famous Grotto, where the Blessed Virgin Mary appeared to St. Bernadette Soubirous a total of 18 times, from February 11 to July 16, 1858. As I suspect almost anyone who has ever been there will gladly confirm, it is certainly an awesomely inspiring experience to go as a pilgrim to that beautiful and special place – joining the 5 million people of varied backgrounds who journey to that holy shrine each year. 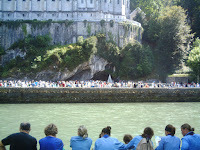 Lourdes, like Rome, offers that very special experience of the universality of the Church, as one joins one’s prayer with pilgrims from all over the world in such great gatherings as the daily procession with the Blessed Sacrament and the evening candlelight procession and group rosary. It is especially inspiring to see so many sick people travel to Lourdes to pray for physical and spiritual healing there, and also to observe the compassionate and loving way in which the sick are welcomed and enabled to participate in all the various activities. Since 1858, the Church has recognized some 65 miracles at Lourdes. In addition to the Grotto itself, the shrine also features the miraculous spring of water, from which one can drink and into which one can submerge oneself – as I did one very cold morning on my first pilgrimage to Lourdes. (I still have a supply of Lourdes water from my last trip there). The shrine also includes four distinct churches, three beautiful churches built one on top of the other, each larger than the one below. The fourth church, separate from the previous three, is actually an enormous underground basilica, which was dedicated by Blessed John XXIII in March 1858, in the centennial year of the apparitions, just a few months before his election as Pope. Perhaps it really is an inevitable characteristic of modernity’s self-induced social disruptions and moral unraveling, but it seems to me that people increasingly seem to be having a harder and harder time accepting that anything can be ever be settled. Once upon a time, elections and the legislative process in democracies and authoritative pronouncements in religion were seen as appropriate vehicles for settling certain matters. Nowadays, however, the losing side on any controverted question seems less and less willing to accept that the matter has been settled. All that is solid melts into air seems like an increasingly fitting description for our loss of that fundamental requirement for an community that some things be accepted as settled. Of course, the fact that an issue may have been “settled” does not guarantee that it has been settled in the best way possible – let alone justly. There certainly are circumstances when one would feel justified – even obligated – to press on in opposition. The war in Europe was de facto "settled" in Germany’s favor in 1940 – except for the United Kingdom’s obstinate insistence on continuing the fight (for which we subsequent generations of beneficiaries ought to be eternally grateful).The claim of a constitutional right to abortion was similarly “settled” by the U.S. Supreme Court in 1973 – except in the minds and hearts of millions of Americans who have refused to become collaborators (even passively) in the legalized slaughter of millions of unborn children. Certainly there some “settled” questions that should not be treated as such. A democratic political process makes provision for revisiting previous decisions. Laws can be amended - and even repealed. The U.S. Constitution itself can be amended – and (as happened once in the last century) an amendment may itself then be repealed. But these are largely exceptions to the general pattern. Exceptions there will always be; but, in a successfully fucntioning democratic polity, such exceptions must always be seen as precisely that - exceptions to the norm. The norm is that elections are taken as decisive, and that they have consequences for policy. Prolonged challenges to electoral results and to the presumptive legitimacy of democratically elected officials damage the process – and thus the polity. A democratic political culture, of course, must allow for dissent and provide vehicles for policy change, but it also presupposes a willingness to live with political outcomes that one has opposed. The constant undermining of democratic legitimacy in civil society and of religious authority in church communities can only further weaken the bonds that hold a community together and enable it best to fulfill its social purpose or its religious mission. We must entertain each other in brotherly affection. We must be willing to abridge ourselves of our superfluities, for the supply of others’ necessities. We must uphold a familiar commerce together in all meekness, patience, gentleness, and liberality. We must delight in each other, make others’ conditions our own; rejoice together, mourn together, labor and suffer together, always having before our eyes our commission and community in the work, as members of the same body. So shall we keep the unity of the spirit in the bond of peace [cf. Ephesians 4:3]. … For we must consider that we shall be as a city upon a hill. The eyes of all people are upon us. Thanks to Governor Winthrop and his fellow Massachusetts Puritans, Jesus’ challenge to his disciples to be the light of the world and a city set on a mountain that cannot be hidden has been a familiar and particularly powerful one for Americans. In its original context, of course, it referred not to America but to the Church, called by Christ to continue his life and mission by being light for an otherwise dangerously dark world. In the dark of night, a city set on a mountain might itself be enveloped in overwhelming darkness, ominously hidden from view, unless its buildings and streets are illuminated by the lights lit – that is, the good deeds done – by its residents. None of this happens automatically, of course. It’s not like touching a switch. Jesus and his hearers appreciated light – and the effort involved in making a city bright – because they knew natural darkness all too well, experiencing it every night, more frighteningly than we in our electric world can even imagine. Making a fire, lighting a lamp, illuminating a city – in a non-electric world none of that happens automatically. It takes conscious effort, and without effort there is only darkness. The illumination Jesus was talking about requires commitment to the kingdom of God, the coming of which we pray for every day in the Lord’s Prayer – a state of affairs in which God is in charge, a world where God rules, a world transformed by the saving presence and power of Christ, where the forces of evil are in retreat, divisions are undone, and we are not afraid of the dark. Jesus’ life, his death, and (above all) his resurrection have revealed the coming of that kingdom. God really is in charge, despite all appearances to the contrary, despite the obvious and persistent presence and power in our world of darkness, death, evil, and sin. We, however, have to side with the light and reject the dark, which is not so easy as it sounds. For darkness is still powerfully present in our world. People still die, for example, but the resurrection of Christ assures us that death no longer has the final word. People still hate, exploit, and abuse, but God’s kingdom of love, reconciliation, and peace has already begun – here and now – in us. And the risen Lord keeps calling us to live the bright new life of his kingdom. In spite of all that is so terribly wrong in our world, Jesus invites us to follow him into his kingdom, confident that his light will be enough for us all. It is, after all, only natural to hate, exploit, and mistreat. It takes the fire of love to light the lamp of reconciliation and illuminate a city with God’s peace. It takes more than one little light bulb or flickering candle. On our own, we would long ago have been left in the dark; but Jesus himself has provided us with the fire of his Holy Spirit to light up his city, freeing us to share that light with one another. Of course, even a city set on a mountain has to draw its water from the ground below. We’re not on some private planet all by ourselves, but very much a part of this world – in this time, in this place, in this society. (Hence, Governor Winthrop’s detailed instructions to his fellow colonists on what being an authentic political community should entail!) Jesus’ words challenge us to recognize all that his Gospel has to say to our society here and now – and, recognizing that, to do what light is supposed to do and actually make a difference. Just as the light of any one individual candle will continue to burn with its full brightness, no matter how many more candles may be lit from it, we need not worry that the light will be lost if we share it with outers. We need not fear that our city’s light will grow dim as it penetrates the darkness outside. Jesus encourages us to see ourselves not as some frightened, fretful minority, huddled around a weakly lit fire, but as a bright, well-lit city on a mountain that not only can, but wants, to be seen for miles and miles around – a new kind of community that already, here and now, has begun to live the new life of God’s kingdom, a city that not only cannot be hidden but that can, quite literally, light up the world. The media drumbeat for revolution in Egypt continues – its intensity, if anything, increasing as the disorder escalates. Before we were able to watch revolutions “in real time,” we were better able to maintain the distance necessary for making intelligent judgments about their consequences. In our globalized world of instantaneous communication, we have all become “excitement junkies,” eagerly following the latest developments and – wittingly or unwittingly – encouraging them along. (So it’s no accident that demonstrators display signs in English). The Founders and – for much of American history – most Americans at least most of the time had an appreciation for the fit between America’s distinctive political institutions and American political culture. While not unopposed in principle to the spread of American-style democracy to other places, they intuitively understood that not every society works the same way and that what fits well in one setting might not automatically translate to another. During the Cold War, calling oneself “anti-Communist” was virtually sufficient to make one a good guy in American eyes. Nowadays, being for “democracy” (whatever that might mean) seems to suffice. Personally, I hope the Egyptian people (and all peoples everywhere) succeed in establishing a more humane society for themselves. Democratic institutions may contribute to that end, although they also may not. I am reminded of Edmund Burke’s caution (in his 1790 Reflections on the Revolution in France) that we ought first to see what it will please people to do with their liberty before we risk congratulating them on its acquisition! A workable “democracy” may admit of many cultural variations and adaptations, but at least any form of it that most Americans would recognize as such presupposes a political culture in which citizens are not only able and willing to engage each other in a political process (a more exacting demand than it sounds) but also can tolerate not getting their way all the time, that is to say are able and willing to live within some fundamental constitutional restraints (for example, elections at set times, as opposed to a change in government every time a mob takes to the streets). Those who are eager to promote “democracy” in foreign countries would do well I think, to promote, encourage, and facilitate the factors that make such minimal pre-conditions for “democracy” authentic local realities. I had my throat blessed this morning. Yes, this is the annual day when we practice that wonderful tradition! I had a noontime meeting to attend today. So I could not be present myself to help my associate bless throats after Mass. However, to accomodate the many who could not get away from work or wherever to coem to church for the blessing today, we will be repeating the blessing after all the Sunday Masses this weekend. So I will get plenty of opportunities to confer the blessing. It's one of my favorite sacramentals. I think it's really one of the nicest things we get to do in the course of the church year. Under the appropriate circumstances, almost anything and anyone can be blessed, but this particular annual blessing has a particular popularity - and persistence - virtually unequaled. Over the centuries, the Church's catalogue of annual blessings has included all sorts of things, such as horses on St. Stephen's Day and wine on St. John the Evangelist's Day, not to mention bonfires on the Eves of St. John the Baptist and All Saints. Most of those blessings are barely even known among the faithful today. The blessing of St. Joseph's Table and the blessing of Easter Food remain popular in certain places, particularly among certain ethnic communities. But, of all the traditional annual blessings, the one most persistently popular and most widely practiced in the United States is surely today's blessing of throats. What accounts for this? According to tradition, St. Blaise, in whose memory throats are annually blessed on his feast day, was an Armenian physician, who became a bishop and was martyred early in the 4th century, and who supposedly healed a boy who was choking to death from fish bone. Devotion to him (and his healing powers) spread widely in both the eastern and western churches, which celebrate his memory on February 11 and February 3 respectively. In the medieval west, he achieved particular popularity as one of the "14 Holy Helpers." Like most pre-modern life, medieval life was hard, and help from almost any source was much valued and sought after! Of course, life can still be very hard even today - especially when illness intervenes. Hence, the perennial appeal of healers. (For that reason I suspect that saints who acquired a reputation during their earthly lives as healers have a certain advantage in getting canonized, since their proven track record must be an incentive for people to continue to invoke their aid and pray for their intercession - thus possibly resulting in the necessary after-death miracles for beatification and canonization). Miracles matter - not just in saint-making but in daily life, as long as life is hard and so much of it is beyond our control. Certainly sickness is one of the situations in which life repeatedly shows itself beyond our limited capacity to control. The blessing of throats intentionalizes the Church's prayer for the sick and highlights the Church's long-standing historical commitment to and involvement in healing ministries. The fact that St. Blaise was himself a physician certainly speaks to the spiritual significance of the ministry of healing and the social value of all healing professions - doctors, nurses, PAs, EMTs, etc. Through the intercession of St. Blaise, Bishop and Martyr, may God deliver us from every disease of the throat and from every other illness: In the name of the Father and of the Son and of the Holy Spirit. That wonderful old English carol (originally a form of catechesis in a time of persecution) stops at the 12th day, but today is actually the 40th day of Christmas. Like Christmas itself, this is a very ancient feast, rich in multiple meanings. Just consider the various names this day has had over the centuries. In the Eastern Churches, today is called the Encounter, the Feast of Meeting. In the West, we currently call it the Presentation of the Lord, but for several centuries it was the Purification of the Blessed Virgin Mary. And its most common title in English remains Candlemas Day, because of the special Blessing of Candles and Procession with which we began this celebration. All these different names hint at how full of meaning this festival is, and how much it has to teach us. In our electricity-illuminated world, candles are quaint and cute – and, for some, romantic. But before electricity, candles were none of those things. They represented light – above all, light at night, light in the dark. Especially in winter, when the days are dark and the nights are long, light is treasured. And so we have a series of winter light festivals, of which Christmas itself is the most elaborate, with Candlemas coming at the end of the winter-Christmas season. The secular American equivalent of Candlemas is, of course, “Groundhog Day” – not the movie, but the day itself and the peculiar customs connected with it. So even people who have never heard of Candlemas and long ago left Christmas behind with the rest of the past year still recognize this day and connect with the change of seasons. The weather may still be wintry, but the days are definitely getting longer. Unlike Christmas, which came at the mid-point of the dark season, with winter’s shortest day and longest night, Candlemas comes at the mid-point between the winter solstice and the spring equinox. Soon, day and night, light and dark will be equal everywhere in the world. And so this final winter light festival looks forward. And so, even as we recall the joy of the Lord’s first entry into his Temple – and suddenly there will come to the temple the Lord whom you seek, and the messenger of the covenant whom you desire [Malachi 3:1] – at the same time we hear, in Simeon’s words to Mary, the first warning reference to what lies ahead, the first reference to the cross. Behold, this child is destined … to be a sign that will be contradicted – and you yourself a sword shall pierce – so that the thoughts of many hearts may be revealed [Lk. 2:34-35]. So, even while we take a last look back at Christmas, Candlemas looks ahead to Lent and reminds us that the whole point of Christmas is Easter. Today is also called the Encounter, the Feast of Meeting. Today Christ comes to meet us, and we get to meet him. The Ceremonial of Bishops says that “on this day Christ’s faithful people, with candles in their hands, go out to meet the Lord and to acclaim him with Simeon, who recognized Christ as ‘a light to reveal God to the nations.’ They should therefore be taught to walk as children of the light in their entire way of life, because they have a duty to show the light of Christ to all by acting in the works they do as lighted lamps” . When Simeon and Anna experienced in Jesus the human face of God, they spoke about the child to all who were awaiting the redemption of Jerusalem. They hastened to proclaim the good news. That is still very much our task too today – to take the light of these candles out into our still very dark world and so to share with all the light reflected in our own lives from the brightness of the human face of God. Homily for the Feast of the Presentation of the Lord (Candlemas Day), Immaculate Conception Church, Knoxville, TN, February 2, 2011.